OMG it's officially mid-December!!! What the heck, people??? Where did 2014 go? No lie I was just getting used to it being 2014 and now it's changing again!? This was definitely the fastest year ever! I'm talking the 'boring old lady' kind! Check it out!! 1. For as long as I can remember I have kept a paper calendar. ***NEW YEAR'S RESOLUTION ALERT*** I'm switching to a digital calendar for 2015! (more on that in a future post!) But for the last 12+ years I've kept a desk calendar! With lots of sticky notes & things highlighted (& color coded, obv!). Want to try to make a date when we bump into each other in Target? Not gonna happen! Text me what dates are good for you & I'll get back to you once I get home and check the bible calendar! Like an old lady, right? 2. I'm cool with getting into bed at 8pm! And once I crawl in, even if I tell myself that it's only for a few minutes, I'm done! It's like a force pinning me down that won't let me get back up...I'm toast! I turn on the TV & I'll see you all later tomorrow! 3. I love Lifetime & Hallmark Channel movies! Totally a grandma move - and I know because MY grandma & I discuss, in detail!, the movies that we watch! How they're still coming out with new movies is beyond me....there are movies on at all hours of the day! It's crazy - but very entertaining! 4. Commercials, TV shows, songs, movies...they all make me cry! 5. We eat dinner early...if we're home usually before 5! 6. As social and extroverted as I am, I like being home. In my pajamas, with socks, no makeup, glasses on, hair in a bun! 7. I can't sleep in. 8. I don't eat raw sushi. California roll, Boston roll or Shrimp Tempura roll...super boring = super grandparent-like! 9. Until I started this blog I wasn't on Twitter, Instagram or Pinterest! And I really knew nothing about any of them! 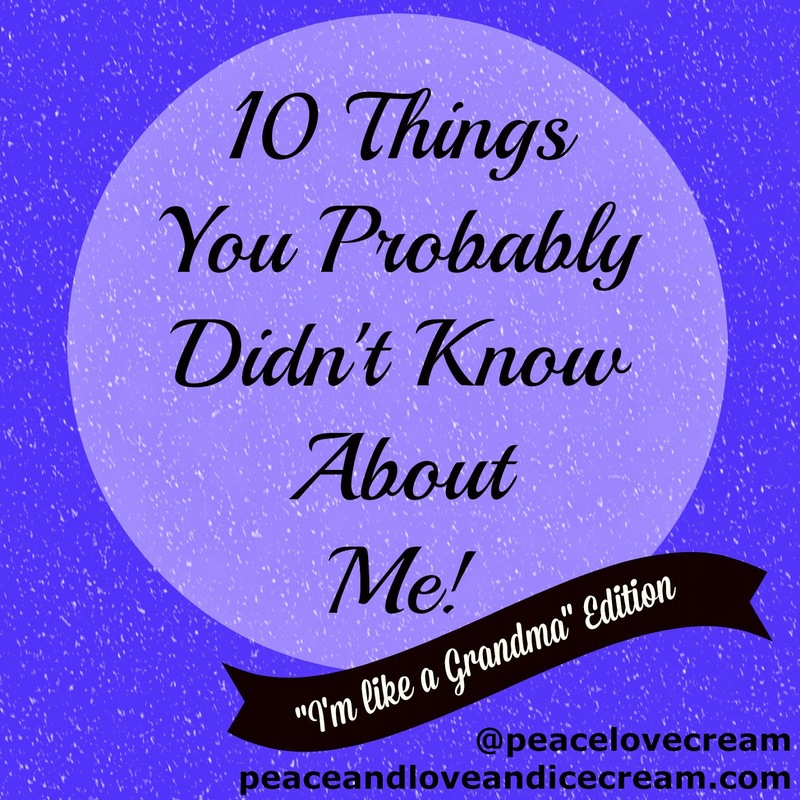 Thankfully after starting Peace, Love & Ice Cream and joining all of these social media networks I learned EVERYTHING that I ever wanted to know......and became a WAHM!! I started doing Social Media Marketing work through a great boutique marketing firm & then even started my own SMM business with my OWN clients - and I love it!! 10. I've been dating my husband since I was 16! So tell me.....Are you like grandma/pa?? ?